A human cortical pyramidal cell. Pyramidal neurons (pyramidal cells) are a type of neuron found in areas of the brain including the cerebral cortex, the hippocampus, and the amygdala. Pyramidal neurons are the primary excitation units of the mammalian prefrontal cortex and the corticospinal tract. Pyramidal neurons were first discovered and studied by Santiago Ramón y Cajal. Since then, studies on pyramidal neurons have focused on topics ranging from neuroplasticity to cognition. One of the main structural features of the pyramidal neuron is the triangular shaped soma, or cell body, after which the neuron is named. Other key structural features of the pyramidal cell are a single axon, a large apical dendrite, multiple basal dendrites, and the presence of dendritic spines. The apical dendrites arise from the apex of the pyramidal cell's soma. The apical dendrite is a single long thick dendrite that branches several times as distance from the soma increases and extends towards the cortical surface. The basal dendrites arise from the base of the pyramidal cell's soma. The basal dendritic tree consists of three to five primary dendrites. As distance increases from the soma, the basal dendrites branch profusely. Pyramidal cells are among the largest neurons in the brain. Both in humans and rodents, pyramidal cell bodies (somas) average around 20 μm in length. Pyramidal dendrites typically range in diameter from half a micrometer to several micrometers. The length of a single dendrite is usually several hundred micrometers. Due to branching, the total dendritic length of a pyramidal cell may reach several centimeters. The pyramidal cell’s axon is often even longer and extensively branched, reaching many centimeters in total length. 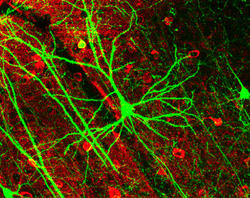 Dendritic spines receive most of the excitatory impulses (EPSPs) that enter a pyramidal cell. Dendritic spines were first noted by Ramón y Cajal in 1888 by using Golgi's method. Ramón y Cajal was also the first person to propose a physiological role of dendritic spines: increase the receptive surface area of the neuron. The greater the pyramidal cell's surface area, the greater the neuron's ability to process and integrate large amounts of information. Dendritic spines are absent on the soma, and the number of spines increases away from it. The typical apical dendrite in a rat has at least 3000 dendritic spines. The average human apical dendrite is approximately twice the length of a rat's, so the number of dendritic spines present on a human apical dendrite could be as high as 6000. Pyramidal specification occurs during early development of the cerebrum. Progenitor cells are committed to the neuronal lineage in the subcortical proliferative ventricular zone (VZ) and the subventricular zone (SVZ). Immature pyramidal cells undergo migration to occupy the cortical plate, where they further diversify. Endocannabinoids (eCBs) are one class of molecules that have been shown to direct pyramidal cell development and axonal pathfinding. Growth factors such as Ctip2 and Sox5 have been shown to contribute to the direction in which pyramidal neurons direct their axons. Pyramidal cells in rats have been shown to undergo many rapid changes during early postnatal life. Between postnatal days 3 and 21, pyramidal cells have been shown to double in the size of the soma, increase in length of the apical dendrite by fivefold, and increase in basal dendrite length by thirteenfold. Other changes include the lowering of the membrane’s resting potential, reduction of membrane resistance, and in increase in the peak values of action potentials. Like dendrites in most other neurons, the dendrites are generally the input areas of the neuron, while the axon is the neuron’s output. 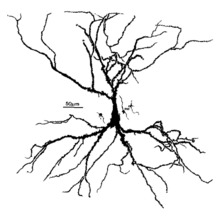 Both axons and dendrites are highly branched. The large amount of branching allows the neuron to send and receive signals to and from many different neurons. Pyramidal neurons, like other neurons, have numerous voltage-gated ion channels. In pyramidal cells, there is an abundance of Na+, Ca2+, and K+ channels in the dendrites, and some channels in the soma. Ion channels within pyramidal cell dendrites have different properties from the same ion channel type within the pyramidal cell soma. Voltage-gated Ca2+ channels in pyramidal cell dendrites are activated by subthreshold EPSPs and by back-propagating action potentials. The extent of back-propagation of action potentials within pyramidal dendrites depends upon the K+ channels. K+ channels in pyramidal cell dendrites provide a mechanism for controlling the amplitude of action potentials. The ability of pyramidal neurons to integrate information depends on the number and distribution of the synaptic inputs they receive. A single pyramidal cell receives about 30,000 excitatory inputs and 1700 inhibitory (IPSPs) inputs. Excitatory (EPSPs) inputs terminate exclusively on the dendritic spines, while inhibitory (IPSPs) inputs terminate on dendritic shafts, the soma, and even the axon. Pyramidal neurons can be excited and inhibited by the neurotransmitters glutamate and GABA, respectively. Pyramidal neurons have been classified into different subclasses based upon their firing responses to 400-1000 millisecond current pulses. These classification are RSad, RSna, and IB neurons. RSad pyramidal neurons, or adapting regular spiking neurons, fire with individual action potentials (APs), which are followed by a hyperpolarizing afterpotential. The afterpotential increases in duration which creates spike frequency adaptation (SFA) in the neuron. RSna pyramidal neurons, or non-adapting regular spiking neurons, fire a train of action potentials after a pulse. These neurons show no signs of adaptation. IB pyramidal neurons, or intrinsically bursting neurons, respond to threshold pulses with a burst of two to five rapid action potentials. IB pyramidal neurons show no adaptation. Pyramidal neurons are the primary neural cell type in the corticospinal tract. Normal motor control depends on the development of connections between the axons in the corticospinal tract and the spinal cord. Pyramidal cell axons follow cues such as growth factors to make specific connections. With proper connections, pyramidal cells take part in the circuitry responsible for vision guided motor function. Pyramidal neurons in the prefrontal cortex are implicated in cognitive ability. In mammals, the complexity of pyramidal cells increases from posterior to anterior brain regions. The degree of complexity of pyramidal neurons is likely linked to the cognitive capabilities of different anthropoid species. As the prefrontal cortex receives input from areas of the brain that are involved in processing all the sensory modalities, pyramidal cells within the prefrontal cortex appear to process different types of input. Pyramidal cells may play a critical role in complex object recognition within the visual processing areas of the cortex. 1 2 Elston GN (November 2003). "Cortex, cognition and the cell: new insights into the pyramidal neuron and prefrontal function". Cereb. Cortex. 13 (11): 1124–38. doi:10.1093/cercor/bhg093. PMID 14576205. 1 2 García-López P, García-Marín V, Freire M (November 2006). "Three-dimensional reconstruction and quantitative study of a pyramidal cell of a Cajal histological preparation". J. Neurosci. 26 (44): 11249–52. doi:10.1523/JNEUROSCI.3543-06.2006. PMID 17079652. 1 2 3 4 Megías M, Emri Z, Freund TF, Gulyás AI (2001). "Total number and distribution of inhibitory and excitatory synapses on hippocampal CA1 pyramidal cells". Neuroscience. 102 (3): 527–40. doi:10.1016/S0306-4522(00)00496-6. PMID 11226691. ↑ Laberge D, Kasevich R (November 2007). "The apical dendrite theory of consciousness". Neural Netw. 20 (9): 1004–20. doi:10.1016/j.neunet.2007.09.006. PMID 17920812. ↑ Mulder J, Aguado T, Keimpema E, et al. (June 2008). "Endocannabinoid signaling controls pyramidal cell specification and long-range axon patterning". Proc. Natl. Acad. Sci. U.S.A. 105 (25): 8760–5. doi:10.1073/pnas.0803545105. PMC 2438381 . PMID 18562289. ↑ Fishell G, Hanashima C (February 2008). "Pyramidal neurons grow up and change their mind". Neuron. 57 (3): 333–8. doi:10.1016/j.neuron.2008.01.018. PMID 18255026. ↑ Zhang ZW (March 2004). "Maturation of layer V pyramidal neurons in the rat prefrontal cortex: intrinsic properties and synaptic function". J. Neurophysiol. 91 (3): 1171–82. doi:10.1152/jn.00855.2003. PMID 14602839. ↑ Magee J, Hoffman D, Colbert C, Johnston D (1998). "Electrical and calcium signaling in dendrites of hippocampal pyramidal neurons". Annu. Rev. Physiol. 60 (1): 327–46. doi:10.1146/annurev.physiol.60.1.327. PMID 9558467. 1 2 3 Franceschetti S, Sancini G, Panzica F, Radici C, Avanzini G (April 1998). "Postnatal differentiation of firing properties and morphological characteristics in layer V pyramidal neurons of the sensorimotor cortex". Neuroscience. 83 (4): 1013–24. doi:10.1016/S0306-4522(97)00463-6. PMID 9502243. ↑ Salimi I, Friel KM, Martin JH (July 2008). "Pyramidal tract stimulation restores normal corticospinal tract connections and visuomotor skill after early postnatal motor cortex activity blockade". J. Neurosci. 28 (29): 7426–34. doi:10.1523/JNEUROSCI.1078-08.2008. PMC 2567132 . PMID 18632946.